Sometimes such an obvious and simplistic approach seems to offer a questionable return on investment in time and effort – meaning can it actually make a worthwhile difference. Let me demonstrate a very dumb example of how and why top-down RAC tuning works. 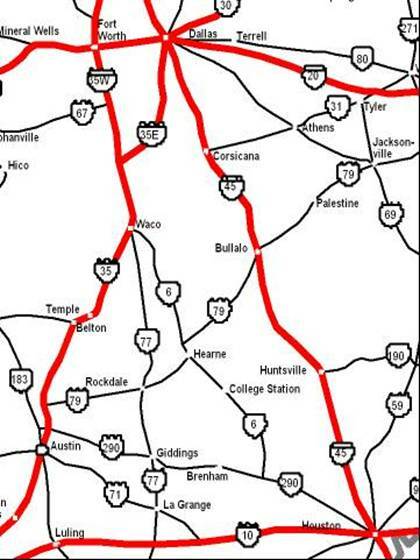 When I first moved to Texas, I had an occasion where I needed to drive from Dallas to Austin. Now instead of simply looking at a map, I asked my neighbor where Austin was located – to which he replied just a little west of Houston. So like an idiot I drove south on highway 45 until reaching Houston, took the 610 Houston bypass west, and looked for any signs saying Austin – which led me to take 290. It took me 7 hours to make the trip! The most logical place to start is with fully comprehending the nature of the application and any special demands to support that nature. Often the knowledge about nature of the application seems to stop with the application architect. However the smart DBA should always be fully informed about what is being attempted, and not simply how it has been implemented within the database objects or code. Remember that in order to understand the “big picture”, we really need to start at the very top and examine the entire system. In order to provide context for that system and all its subsystems, we need to know what it’s trying to do. Otherwise the best we can do is to apply theoretical “golden rules” that may or may not apply. So we will simply be taking hypothetical, best guesses based on feeling rather than fact. Such an approach will generally not lead to optimal results. I cannot overstate just how important this first step is. Everything that is discovered here will flow downstream to every subsystem being optimized. This information will usually help make key hardware and software architectural and configuration decisions that will directly define the limits of what can be achieved during the optimization process. So if we paint ourselves into a corner by skimping on this step, there may well be no solution to solve the experienced performance problems. And since RAC by its nature is more complex than single instance deployments, the ramifications are magnified even further. There are numerous well-known “best practices” for keeping a database application humming along. We all know to write more efficient SQL and/or PL/SQL, use bind variables to reduce unnecessary parsing, maintain up-to-date statistics, partition large tables and their indexes, examine explain plans for in inefficiencies, examine extended trace files for deeper problems, and such. But many times we have zero ability to change or otherwise modify the application code. For example, I’m running a TPC-C benchmark. That is defined by a spec (www.tpc.org/tpcc) and is implemented by a software package (Quest’s Benchmark Factory: www.quest.com/benchmark-factory) – so I have no ability to change the application. You may have third party applications such as ERP and CRM, so you’d be in the same boat. Therefore this is neither an unreasonable nor uncommon example. We often are stuck with the application as is. While I know that the TPC-C and thus OLTP in nature, I also can identify some critical application characteristics by examining the spec – and/or capturing the SQL sent to the database. Either way, I’ll discover that it’s primarily reads with some writes, very small average transaction sizes (i.e. works on a few rows from a few tables at a time), there is high concurrency with some potential for deadlock, and I have to meet ACID compliance relating to the transactions (i.e. logging=yes). That’s actually quite a lot of very useful information for the optimization process, so I’ll carry these finding forward and notice where they might apply across all the various subsystems. As with the database application, there are numerous well-known public networking “best practices”. Once again, we all know to isolate and/or size a public network’s capacity based upon cumulative application needs, use gigabit or possibly ten-gigabit networking technology, utilize only layer 2 or 3 switches, employ switches’ VLAN (virtual LAN) capabilities to further segment loads, “bond” network channels for increased throughput, and several other techniques. As with the public network, there also are many well-known storage networking “best practices”. Once again, we all know to isolate and/or size a storage network’s capacity based upon cumulative application IO needs, employ Fiber Channel or Infiniband for SAN’s, utilize ten-gigabit networking technology for NAS and iSCSI, deploy multiple pathways per storage controllers and HBA, consider TCP/IP offload engines (i.e. TOE’s) or specialized iSCSI HBA’s, and several other techniques. So how could application knowledge have divulged a storage network problem? I once visited a site where for some unknown reason, the RAC performance just tanked. And just like the prior section’s example, extraordinary tuning efforts had been attempted with zero success. So once again I entered the picture and asked a whole lot of relatively dumb questions. I was told that the storage network was leveraging “jumbo frames” – it was initially setup that way, and was that way now. I simply asked to prove it. Imagine their surprise when they found that a recent firmware upgrade on a switch had wiped out the “jumbo frames” settings to the NAS – and the VLAN setting that segregated the storage network. So two minutes to reset the switch setup fixed the problem – which once again had nothing to do with Oracle or RAC. I know these examples may seem hard to believe, but never pass up the opportunity to quickly fix a nasty problem by simply correcting an obvious external yet critical factor. Sometimes life throws us a bone – an obvious yet overlooked problem that is subtle yet highly critical. So just accept whatever easy ones come your way, because we all know that life will throw us more than our share of tough ones. As with the prior topic, there have been hundreds of books and tens of thousands of papers written on how to tune an Oracle database instance. So once again it would be arrogant to think that I could add any purely technical new insight here. But when we now instead ask database “dumb questions”, we find one of the most fundamental and critical factors for performance often possesses an unqualified answer. Namely, when asked why the database block size is 8K, many people say I don’t know – meaning that they just accepted the default in DBCA (Database Configuration Assistant) or have that hard coded in their database creation scripts. Yet this is one of the most important items to base upon the application’s nature. And this issue is even more paramount in a RAC setup, but we’ll examine that issue in the following section about cluster best practices. Some well known and generally agreed upon RAC “best practices” include doubling the ASM instance default parameters for SGA memory size (64MB simply does not scale too well), the interconnect is single most important limiting factor or bottleneck, and consider hash partitions and reverse indexes to spread IO across cluster nodes. Beyond this, many of instance specific optimization “golden rules” may not apply when doing RAC. So test any and all assumptions beyond these just to be safe. Remember the block size question from the prior section? Let examine in more detail why both block size and concurrency can become critical performance factors for RAC. The above diagram depicts how both block and row level contention happens on a single instance database. 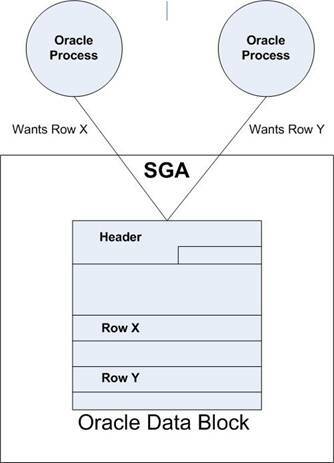 If two Oracle server processes request access to Row X, then we have row level contention or deadlock. But we know from application nature that’s a fairly low occurring event. 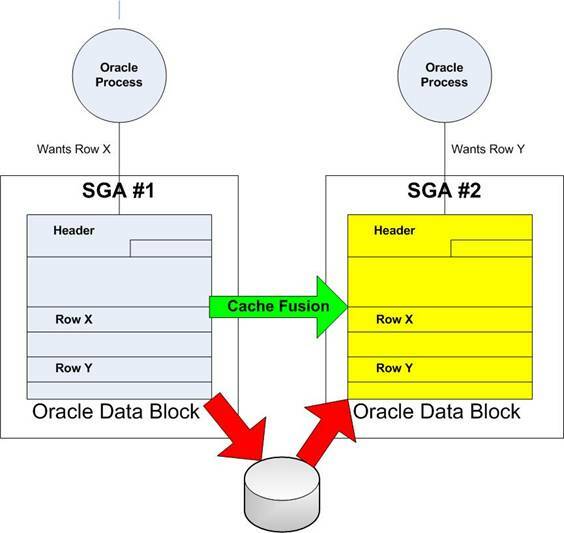 However it’s not unlikely that two Oracle server processes might seek to access different rows within the same block (e.g. Rows X and Y). And as the block size increases, the likelihood of concurrent block access increases – but there’s no real cost in performance terms. Now let’s examine at the exact same scenarios in a RAC database as shown below for a simple two node cluster. As with the other networking issues, there are numerous well-known private networking or interconnect “best practices”. Once again, we all know to isolate and/or size a private network’s capacity based upon cumulative application needs, use gigabit or possibly ten-gigabit networking technology, always utilize “jumbo frames”, “bond” multiple network channels for increased throughput, and several other techniques. But once again our application nature adds a critical piece to the puzzle: we must account for high concurrency. So as the last section identified, we can reduce block contention by reducing the block size and multi block read count. But sometimes those steps alone may not be enough. Sometimes we can project that the concurrency is so high that block level contention cannot be eliminated, but just reduced – so we need a way to further optimize handling for that scenario. That might lead one to increase (i.e. re-nice) the global cache cluster service processes to mitigate this unavoidable cost. As before, we also might be able to make that call up front for very little cost. Just be careful on whatever you may preemptively attempt to handle – because the Interconnect is truly RAC’s Achilles’ heal.